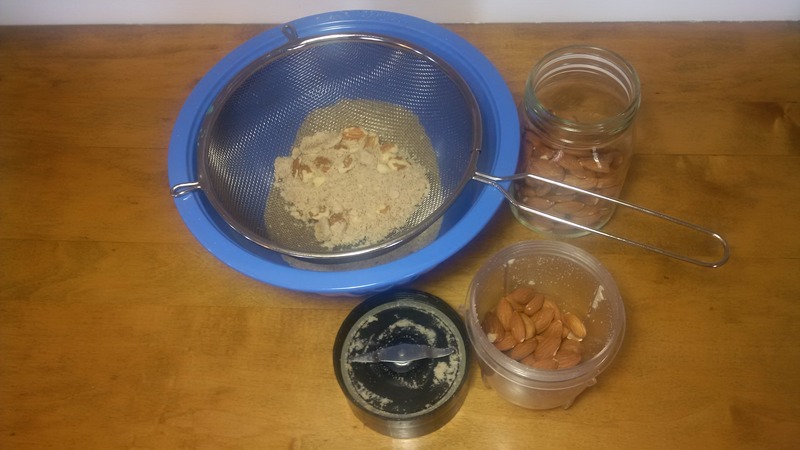 Grinding almonds for baking is a great way to make healthier options. Ground almonds have a short shelve life so I don’t want to chance it buying it from the store. The oils in the almonds can go rancid especially if not refrigerated. I like to take 10 minutes every couple weeks and grind and sift my own. I put it into a glass jar and boom it’s waiting for me in the fridge. I wanted everyone who is going to try my baking to give this a try because most of my creations have this in the ingredients. Try your favorite recipes replacing 1/4 flour for ground almonds. You might not notice a difference. I also like to use a little coconut flour but you definitely notice a difference so I only use small amounts. It absorbs the liquid which makes your food more dense. The almond flour makes food light and moist. 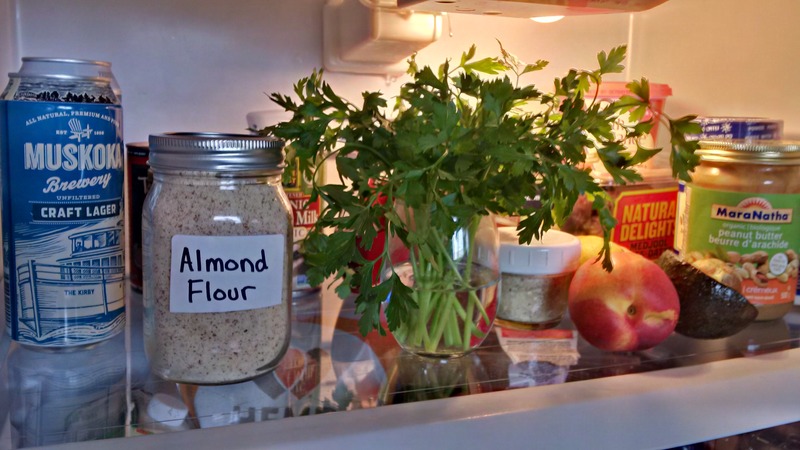 The difference between almond flour is blanched almond and almond meal is raw almonds. But I call mine flour because to me it’s flour. Blender or food processor of some sort, I use a magic bullet with a mill blade which is the same as a coffee grinder. Some kind of sifter, bowl , jar and a spoon to scoop. All you need to know is only blend a little bit then sift and put the unsifted back with more almonds. Continue grinding and sifting until you have enough. If you over blend you will end up with butter. In my raw cookie dough I grind sunflower seeds and sift because I try not to eat raw nuts. Ground oatmeal is also a nice substitute for flour. 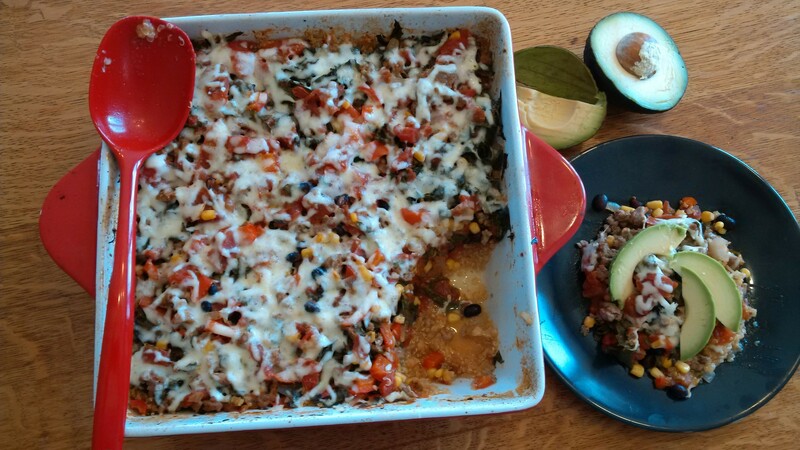 Tomato kale quinoa casserole is one of our family favourite meals and I am so happy to share it with everyone to enjoy! It’s something out of the ordinary, very delicious and uses up extra kale and tomatoes. 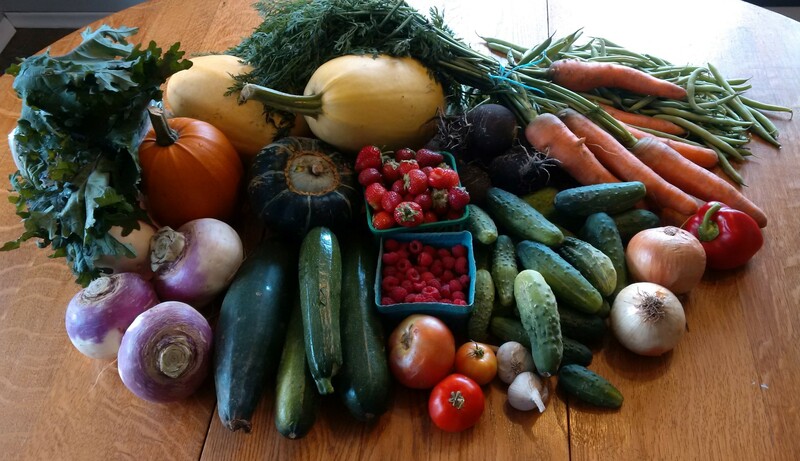 I loaded up last weekend at the fall fair farmers market, my favorite is the spaghetti squash but I love all the vegetables. My favorite vendor Mary Bridget shares her recipes with me and how to cook certain veggies like the black Spanish radishes boiled with potatoes and mashed. I tried and it was yummy! Up until last year I never cooked squash but Mary Bridget told me how to cook each one and with a little practice I also mastered it. No more canned pumpkin for me. I look forward to blog about squash. Mix the following in a bowl and put half on quinoa and stock. Preheat oven to 350 cover with foil and bake for 40 min, remove foil and bake for 10 min more. Top with avocado and maybe more shredded cheese. 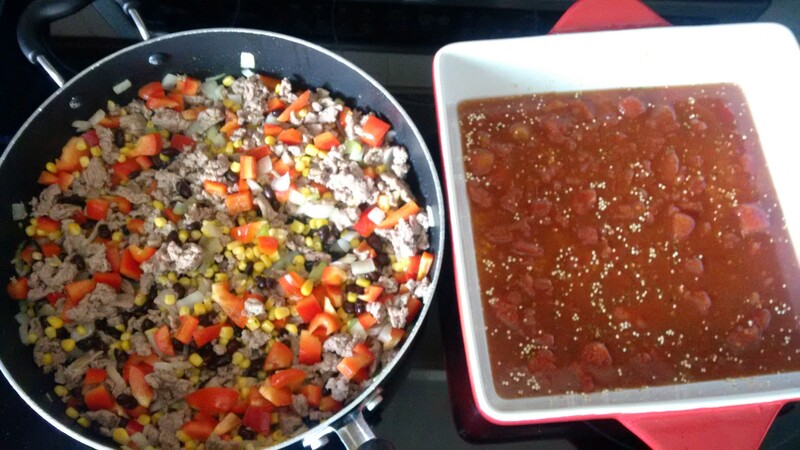 Feel free to add any extra veggies you may have, such as jalapenos. Also nacho chips on the side goes well. I get pretty excited when I have so many locally grown organic veggies! I wish health and happiness to all! 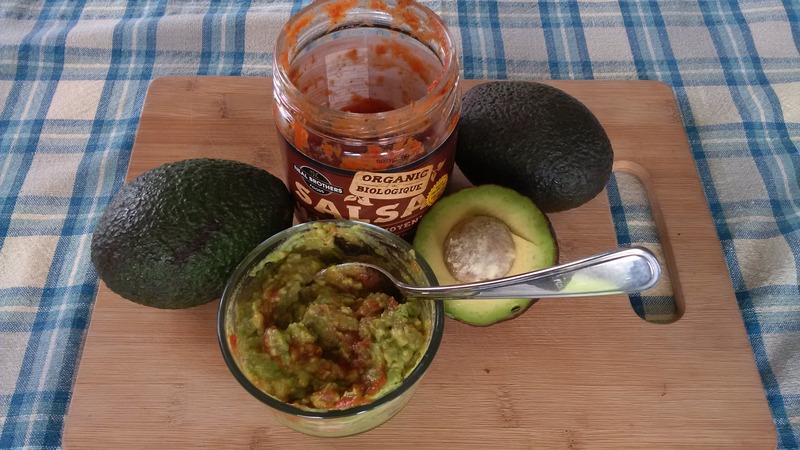 Two ingredients avocado and salsa mashed up and paired with Mary’s crackers, nachos or chips is my favourite go to snack for work. It is so satisfying and it gives me the boost I need to work hard. It can be made so many ways. Some people think they don’t like it because they tried some they didn’t like, well I bet they never tried it with bacon, green onions and chicken. I especially add garlic when I feel my immune system is weak and I don’t care if I have garlic breath because it keeps me from getting sick. 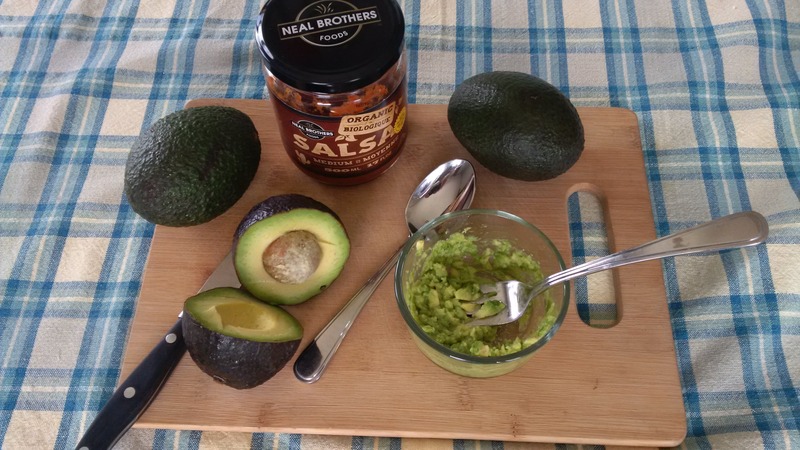 My friend Debbie makes it the traditional way with equal amounts avocado and fresh tomato, cilantro, minced garlic, salt, pepper and a squeeze of lemon or lime. 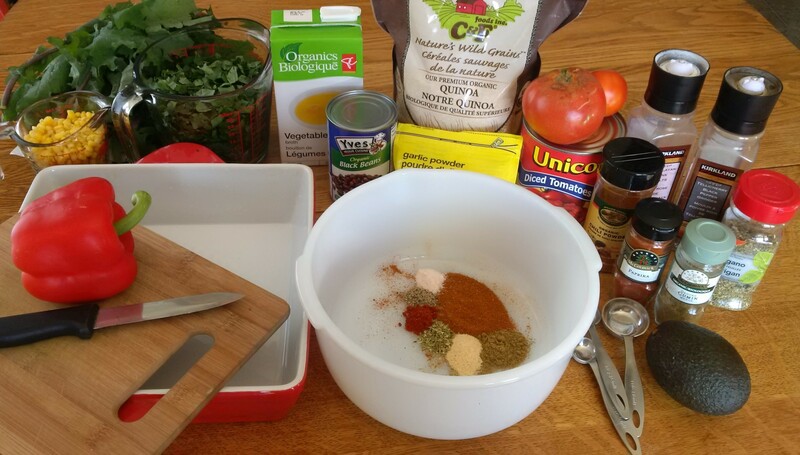 Plus it’s tomato season so this is a great recipe to use them up. All I do is mash up some avocado and add a scoop of salsa. -Buy the avocados green and put in a paper bag to ripen. Then put in fridge and eat within a couple days. Quick! Before peach season is over pick some up! Simple and crowd pleasing! I went to the Windsong music festival last weekend, they had a potluck breakfast Sunday morning. 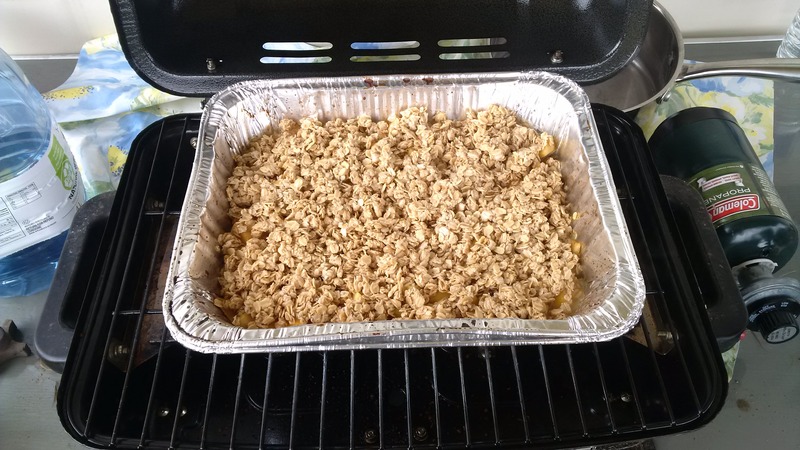 I made peach apple crisp on the BBQ. I creamed the topping before I left so the only thing to do was cutting up the apples and peaches. We all have our own crisp recipe but I find this one to be really easy and good. My family’s favorite is strawberry rhubarb apple crisp but thats for next June when they’re in season. Be creative and use fruit that you like. I like to make a family size and a few little ones for my snack at work or the kids lunches. Freezes well too! I’ve made smoothies with the left overs by using coconut milk and vanilla protein powder. Start first with getting the topping mix ready. 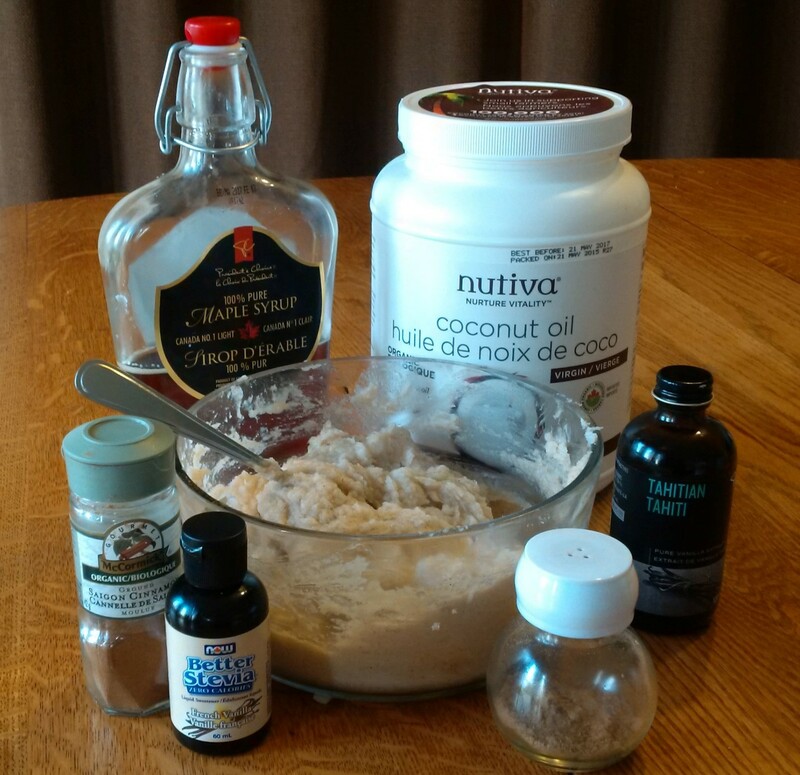 Add just coconut oil or use half butter or just butter, maple syrup or honey to desired sweetness. Then add cinnamon, cardamon, nutmeg and vanilla. 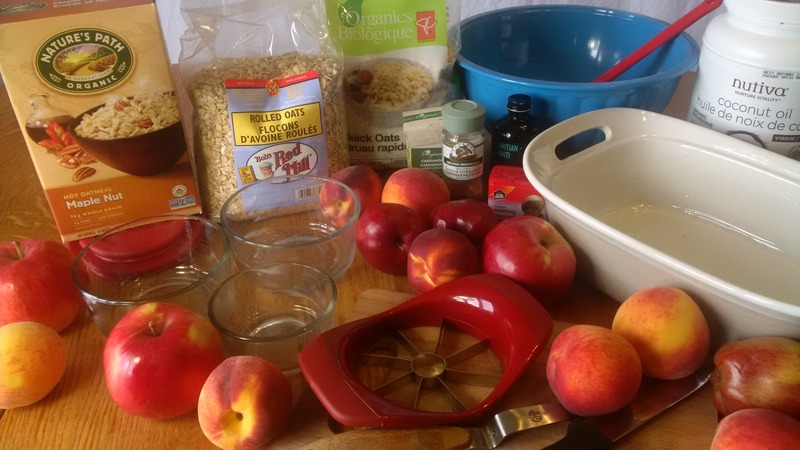 I use less rolled oats and more quick oats. I love pine nuts on top but my kids don’t like any nuts in it. If you want you can use flaxseed, pecans or walnuts. 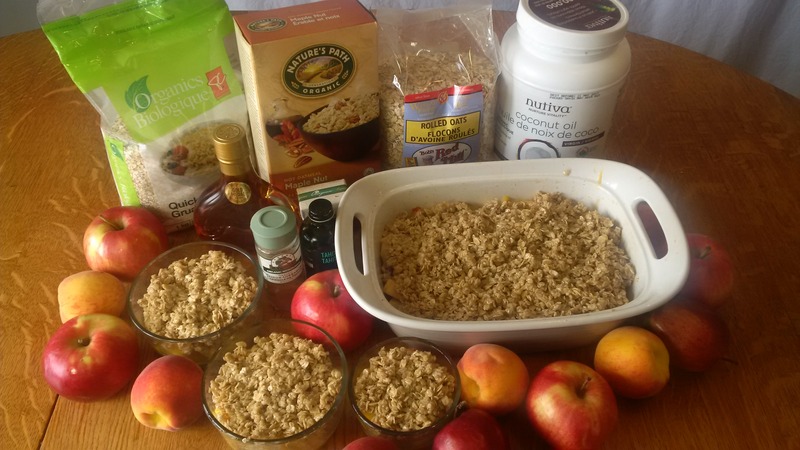 My secret ingredient is one pack of Natures Path maple nut instant oatmeal. Use another kind with no nuts if you are sending to school. The oats should be wet. 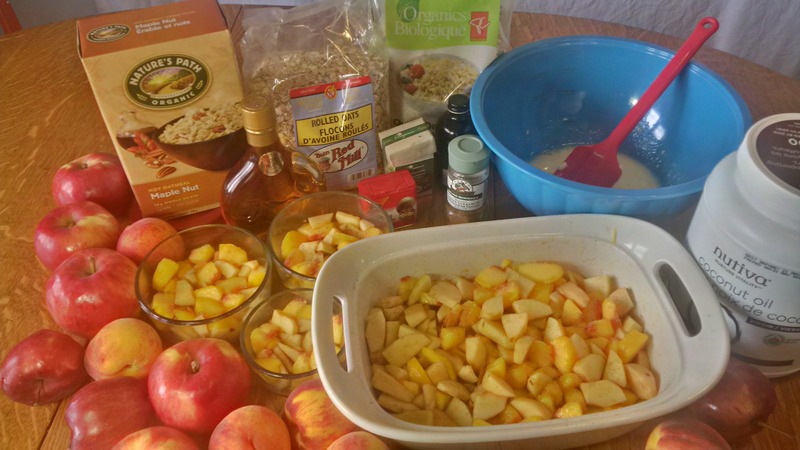 Grease dish(es), cut up equal amounts of peaches and apples then sprinkle cinnamon on top. I like to use more then one kind of apple for variety. Preheat oven to 375 and bake until the top starts to brown, about 30 minutes. I like to turn off the oven and let it sit in there while I do some activity and then I come back an hour later and its perfect temperature. Scoop and pour coconut milk or whatever kind of milk you have on top. Keep it simple and have fun.